Marvel Comics produced a short-run series of Shogun Warrior comics from February 1979 to September 1980 (those are the comic book dates but recognize that comics usually appear on the stands before the publication dates). It's somehow tied into the Mattel toy line with all new stories and artwork by Doug Moench and Herb Trimpe, respectively. It's an interesting adaption that used three giant robots from the toys and produces a reason for them to exist. Interestingly, Marvel only licensed the robots Combattler (Combatra in the comics and Mattel toys), Dangard Ace and Raydeen. 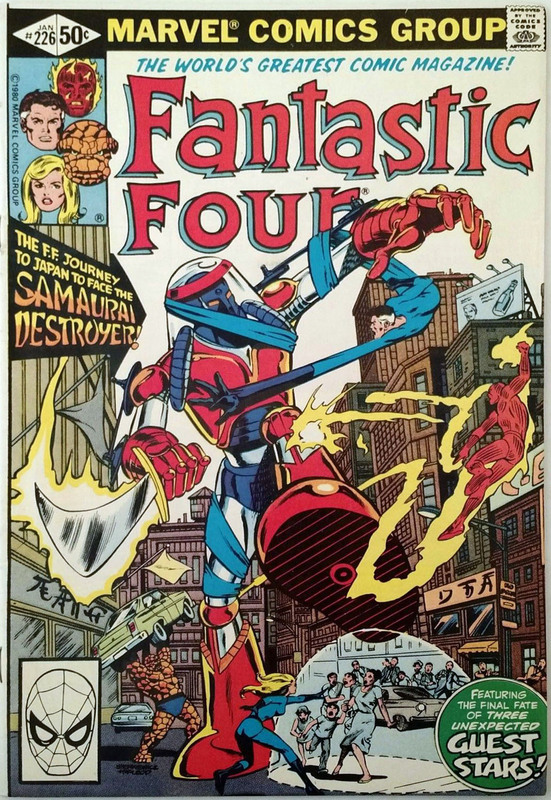 The comics ran for 20 issues and suddenly stopped (speculation was that the licensing ended but it's my belief it was due to sales), apparently completed in Fantastic Four #226 by the giant robot Samurai Destroyer. There was also a Godzilla comic produced concurrently with the Shogun Warrior comic that incorporated a new giant robot called Red Ronin (something from the minds at Marvel though they may have referenced Red Baron or Mach Baron for some of the design ideas). Both Samurai Destroyer and Red Ronin have been produced by collector Tom Hughes as custom jumbo machinders. "Into the lair of demons"
"The many heads of Cerberus!" FF #226 "The Samurai Destroyer"
All Marvel Comics images and captions are copyright Marvel Comics. Mattel images and captions are copyright Mattel, all Popy images and captions are copyright Popy/Bandai and used without permission. All other content, including images and editorial, is Copyright © 1997-2017 John Eaton and/or contributors unless otherwise stated. If there are any comments or objections, please contact John Eaton, by clicking here. Fantastic Four #226 was a shameful end to The Shogun Warriors. Very sad.